A Disposable Surgical Scalpel consists of two parts, a blade and a handle. The Blade is a small, light, thin and extremely sharp, usually straight, knife, used in surgical & anatomical operations and dissections. It is used once only, in surgical applications. The handle, generally made of plastic, is reusable. It is also known as a "B.P. handle", named after Charles Russell Bard and Morgan Parker, founders of the Bard-Parker Company. 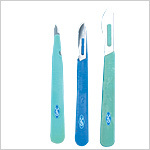 Thus the Surgical Blade combines a detachable & disposable blade while the handle is reusable. GPC Medical Limited, the worldwide known manufacturers & exporters of various hospital equipment & devices, produce high quality Disposable Surgical Blades also. Manufactured from the high grade carbon steel, our Surgical Blades are produced under strict quality control procedure. Known for precision, they provide a smooth incision, meeting the exact requirements of the surgeons. Available in different sizes, our Disposable Surgical Blades are extremely suitable for hospitals, surgical centres & other healthcare institutions. They are constantly in big demand from various countries worldwide. 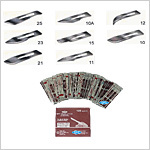 Send Your Buy Requirement For "Surgical Blades" AND Get Quote Quickly.